An algal bloom is a rapid increase or accumulation in the population of algae in a water system. It can break the balance of an aquatic ecosystem and hence threaten the quality of drinking water. Therefore it’s really important that we are able to develop reliable models to predict algae growth and the effects this would have on access to safe drinking water. Having that in mind, Nie and co-workers suggest new prediction and control models for algal blooms in the urban section of the Jialing River, one of the tributaries of the reservoir and home of more than 8 million people. Fig. 1 – Comparison between CAA and related parameters. Enzyme activity has been shown to be useful as early indicator in algal blooms. Algae growth is usually accompanied by a high nutrient concentration, carbon, nitrogen and phosphorus being the most abundant elements. Whereas there are a number of studies relating N and P to algal blooms, studies with C are far outnumbered. The enzyme responsible for taking inorganic carbon sources into the algae cells is the carbonic anhydrase (CA). It catalyses the transformation of aqueous HCO3– into CO2, which is then transferred into the cells by diffusion to be transformed back into HCO3– that will later be used in the process of carbon fixation. Measuring the carbonic anhydrase activity (CAA) is cheaper, faster and more accurate than other techniques used to predict algal blooms. However, as such a complex process, it is necessary to link CAA to other micro parameters, which then should give a good starting point for predicting and controlling algal blooms. 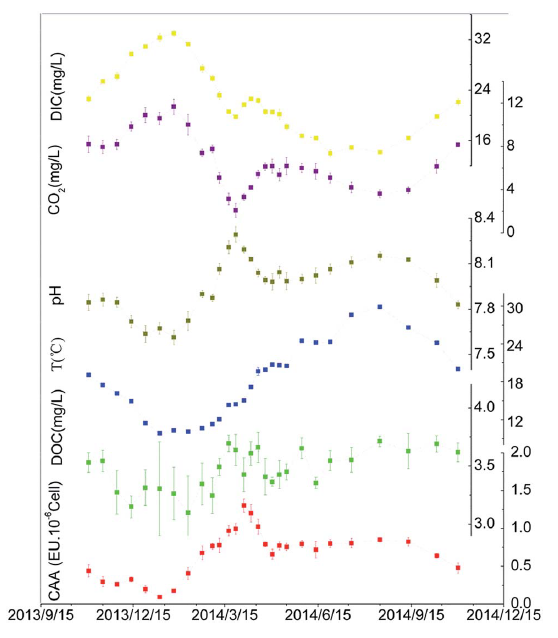 This study, based on the urban section of the Jialing River, investigated the different form of carbons, water temperature, flow velocity (V), pH, CO2 concentration, CAA and algal cell density and the relations between these factors. The data was collected in four different sites alongside the river from December 2013 to October 2014. After analysing all these parameters, Nie and colleagues found the following correlations between them, CAA and algal cell density (Fig. 1 and 2). Fig. 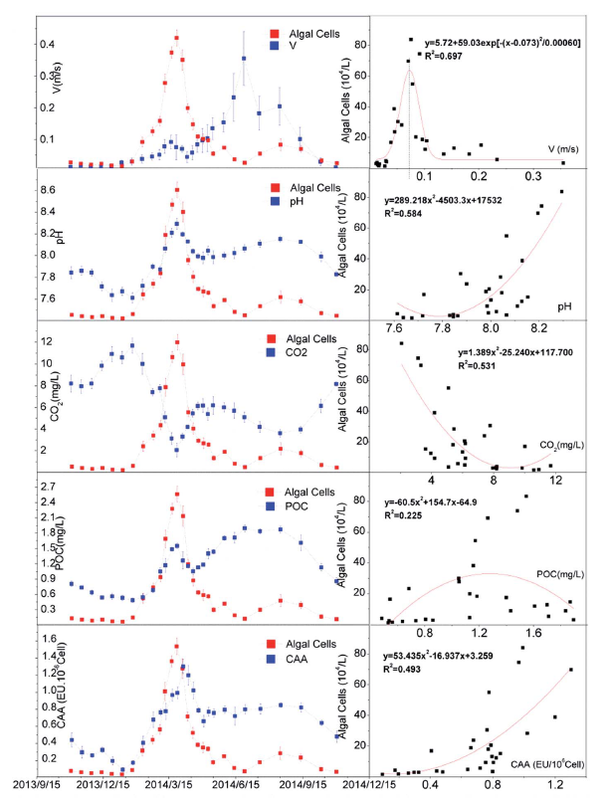 2 – Comparison and fitting between algal cell density and related parameters. Nie and colleagues could determine whether an algal bloom would occur based on the conditions of algal cell density. The threshold for algal blooms was set in 0.2 x 106 cells per L. Considering the positive correlation between the density of algae and CAA, the threshold for algal blooms was set in 0.650 EU per 106 cells and 0.864 EU per 106 cells. This means that when algal density is increasing and CAA is higher than 0.650 EU per 106 cells, an algal bloom will occur. On the other side, if CAA is lower than 0.864 EU per 106 cells and algal density is decreasing, the algal bloom will disappear. With these models, algal blooms can be predicted and controlled in the Jialing river. *Access is free until 16/08/2016 through a registered publishing personal account.